111.99 GBP In stock, ready to dispatch. With its brilliant sound quality, the Jabra Speak 510 + UC - portable UC speakerphone - provides you with the ability to convert any room into a conference room for increased productivity. Users can easily connect their Jabra speak to a PC, smartphone, or tablet via USB or Bluetooth, and then you can dial in. The Jabra speak natural sounding, crystal-clear sound that allows attendees to speak and hear clearly across any environment. 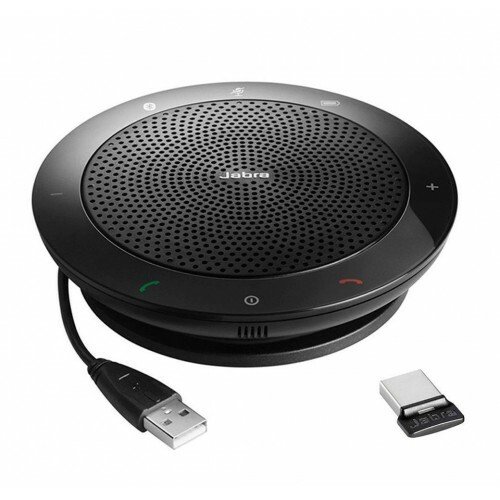 The Jabra PC suite facilitates remote call control owing to the combination of Jabra headsets with the latest generation of Unified Communications and IP softphones. With the wireless headset, you can answer and end calls while away from your workstation and softphone, whereas the corded headset offers multiple remote control functions from the in-line buttons on the cord, or from the headset. Why should you buy the Jabra Speak 510? It is enhanced with USB and Bluetooth to connect to any mobile device, and offers full compatibility with any Bluetooth enabled device and leading UC/softphone solutions, offering you unlimited communication mobility and optimal user experience. Superb sound via Bluetooth, even music streamed from my mobile phone sounds great. A little bit pricey, but the quality of the item may explain this. This is great I was able to connect this to my smartphone and tablet using the usb and bluetooth. Easy to set up and use. Perfect for conference calls and sound quality is amazing. Quite possibly the best piece of IT equipment I've ever bought. So easy to set-up - works straight out of the box & has transformed the way I conduct conference calls & Skype messaging. The sound quality is outstanding & much better than I thought it would be. You can also plug in a headset for privacy. I'd had problems with audio over IP in the past depending on individual PCs & whether they were in a docking station & this has solved everything. Fantastic value for money. Can't recommend highly enough!